The Amprobe PM55A is the ultimate pocket-sized multimeter. Only 3/8" thick and less than 3 oz in weight with full functionality offering AC and DC voltage measurement to 600 V, AC and DC current to 2000 μA, resistance to 6 Megohm, capacitance to 2000 μF, frequency to 30 kHz, diode test and continuity with beeper. It also offers VolTect™, a built-in, non-contact voltage detection feature for AC voltages. 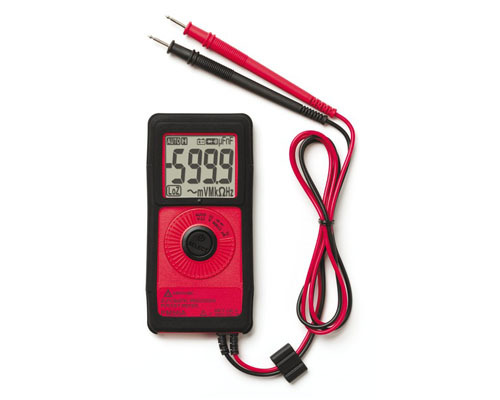 Another key feature of this pocket multimeter is AutoTect, which automatically selects between AC and DC voltage, or resistance measurement based on the test point to which the leads are connected. Fully auto ranging, this meter offers nine different measurement functions plus features that are usually found in much more expensive and larger meters. The digital display is oversized with large digits and unit icons in the display. In spite of its size, this pocket multimeter is fully safety rated to CAT III 300 V, CAT II 600 V and is UL listed. No other meter this small offers such performance and high safety ratings. The PM55A Pocket Multimeter includes a silicone protective holster, deluxe carrying case, attached test leads, battery and manual.